In planting seeds of the old world in the new, Mymnir becomes queen of a land with as many problems as the one she fled. Her long-lived Fae children ignite and fan feuds that span generations; lives are lost and loves won because of their tampering. 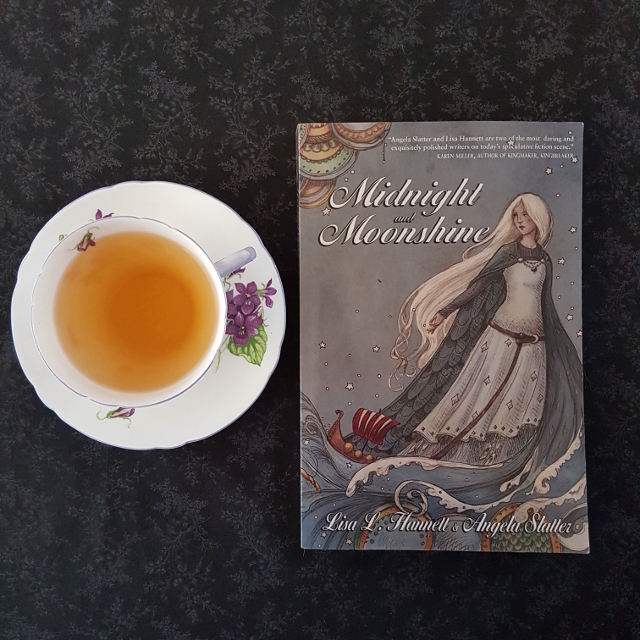 Told in thirteen parts, Midnight and Moonshine follows the Beaufort and Laveaux families, part-human, part-Fae, as they battle, thrive and survive in Mymnir’s kingdom. Midnight and Moonshine is a collection of interconnected tales with links between them as light and strong as spider-silk. From fire giants to whispering halls, disappearing children to evening-wolves, fairy hills to bewitched cypress trees, and talking heads to moonshiners of a special sort, Midnight and Moonshine takes readers on a journey from ninth century Vinland to America’s Deep South in the present day. Hannett and Slatter have created a mosaic novel of moments, story-tiles as strange as witchwood and withywindles. Midnight and Moonshine is a rich tapestry of dark fantasy, fairy tale and speculation. I don’t usually buy books simply for their covers, but I couldn’t resist Kathleen Jennings’s beautiful art. Fortunately, Kathleen is very discerning about who she works for. Lisa L. Hannett and Angela Slatter have written a gorgeously lyrical collection in Midnight and Moonshine. The thirteen stories that make up the book weave Norse mythology with history, stitching it together with horror and fairytales. These are not light stories. Rather, as befits their influences, they are stories that dwell on grievances and vengeance. The characters destroy each others’ lives down through the ages. But the multi-generational aspect of the book gives it an edge of hope–there are always those that survive, fall in love, make a family. This book wasn’t an easy read. The stories span a long stretch of time; it was often an effort to figure out roughly how much time had passed since the last story and what the current relationships were between the different parties. Physical characteristics help keep track of who belongs to which family, but I still found it confusing from time to time. I also found it difficult in the earlier stories to get a feel for the period of history in which they were supposed to be set. This isn’t a problem, per se, but after their feeling of fairytale timelessness, it was a jolt to reach the middle of the book and find a story grounded in a very specific time and place in the real world. I suspect there were historical clues I missed picking up in the earlier stories–history isn’t my forte. The writing style is as beautiful as the cover. There’s a gorgeous lyricism to the stories that adds to the fairytale feel of the earlier tales. It changes somewhat in the later tales, morphing into language appropriate to the time and place. For example, Of the Demon and the Drum is told in Cajun dialect. I’m generally not a fan of stories told solely in dialect, so I was surprised the story ended up being one of my favourites of the collection. Each of the stories stands reasonably well on its own. However, the interlinked aspects give additional context that enriches the stories. I liked the way the fates of previous characters were revealed in the following story by their children–or often their children’s rival or a completely unrelated character who becomes drawn into the web.